And I was so, so disappointed, because I had wanted to read it since it first came out, even moreso after I heard it was being adapted into a series on Netflix. I love werewolves, I love post-industrial town settings, and I love creepy paranormal murders, all things that I was promised in this updated take on the Gothic novel. Instead, I got lackluster characterizations, a slow and frequently-lost plot, bizarre allusions to concepts that were never resolved, tortured writing, and some final twists that were eyeroll-inducing. In this case, spending a bit of time away from short story collection xo Orpheus was a good thing. It helped me to determine which stories actually moved me and gripped me beyond the short time I spent reading them, which stories went completely and bafflingly over my head, and which stories produced images or descriptions that are still lingering in my mind today. In a collection that I found to be somewhat frustratingly uneven, some distance was necessary for a more tempered–and hopefully more helpful!–review. xo Orpheus is a collection of fifty “new myths,” or myths from a variety of times and cultures that have been altered without becoming unrecognizable. Many are the familiar Greek myths that many of us were raised on–including several different takes on the myth of Persephone–while others come from cultures that may be less well-known to a modern Western audience. Still, all of them dealt in some way with the same very human themes: love, death, loyalty, fear. Life, really. Some of the stories take myths and adapt them for contemporary settings; others expand upon the original myths in their intended time and place by giving us a new point of view or an epilogue. 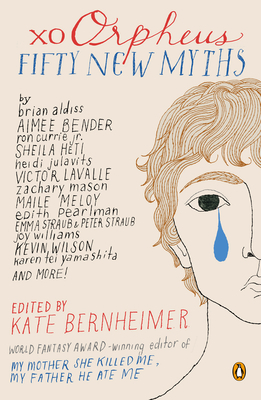 I commend the idea behind this collection, because as Bernheimer herself says in her introduction, myths themselves are timeless; they have had a hold on the human imagination for centuries, and have certainly not lost their grasp on us yet. I’ve highlighted below the stories in xo Orpheus that made the biggest impact on me, but the beauty of a collection this large, spanning so many authors and so many myths, is that there is truly something for everyone. For example, while some of the more postmodern offerings (“The Story I am Speaking to You Now,” “Belle-Medusa,” “In a Structure Simulating an Owl”) were not to my taste, I know people who would have delighted in their unconventionality! Though I didn’t find myself too impressed with The Passage, the first in Justin Cronin’s apocalyptic vampire trilogy, I ended up reading the second novel in the series, The Twelve , since my hold on a library copy finally came through. (I requested it when it came out in October 2012, so that should give you an idea of how popular the series is!) But the all-too literary treatment of vampires that The Passage offered only continued in The Twelve, with an added dose of forced spirituality and unbelievable coincidences. This all makes it sound like I hated The Twelve, which I didn’t. It’s a solid three-star read, thanks to Cronin’s ability to inject real fear and tension into the narrative, one or two interesting and pitiable characters, and the desire to know how the heck he is going to wrap this sprawling thing up. Mostly, I think I’m just a sucker for hype. But this series is so fawned over, to the point of garnering a movie deal and getting accolades from writers like Stephen King, that I can’t quite help but feel that I’m missing something. I have waited a long time to read Lauren Beukes’ sophomore offering, Zoo City–it was one of my first TBR adds on Goodreads–and happily, I was not disappointed! In just a few words, Zoo City is a creative, unique, and un-put-downable entry in the urban paranormal/sci-fi thriller genre. In a futuristic Johannesburg, South Africa, our protagonist Zinzi December is eking out a living by finding lost objects with her burden and companion Sloth by her side. Like hundreds of other people around the world, Zinzi is ‘animalled’–after an incident of wrong-doing and the ensuing guilt, an animal has appeared and has become physically and psychically linked to the offending human. There doesn’t seem to be any sort of order to the type of animal that becomes linked to each guilty person; there is a brief mention of someone in prison with a butterfly companion, for example.